Get Moving – Eat Healthy! Exercise programs for gardeners of all ages. To contribute to Michelle Obama’s initiative – Let’s Move Museums and Gardens, the Garden with Ease exercise program could serve as a resource to those museums and gardens committed to offering interactive experiences within a community to promote healthy eating and increase physical activity. 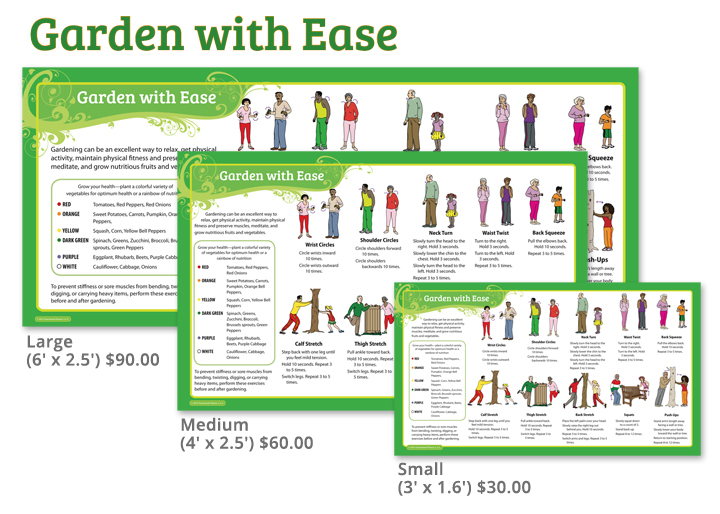 The Garden with Ease program is designed engage the community of all ages to enhance their levels of fitness while working in community gardens. The Garden with Ease program provides a series of exercises to stretch and strengthen the major muscle groups used while working in the garden. These exercises will help prevent stiffness or sore muscles while bending, twisting, digging, or carrying heavy items. Participation in the Garden with Ease program can make a difference in millions of children’s lives as well as their parents and grandparents, thus fostering a positive change in communities throughout the United States. The exercise posters can be tailored to the specific institutions to include their logo and/or name. 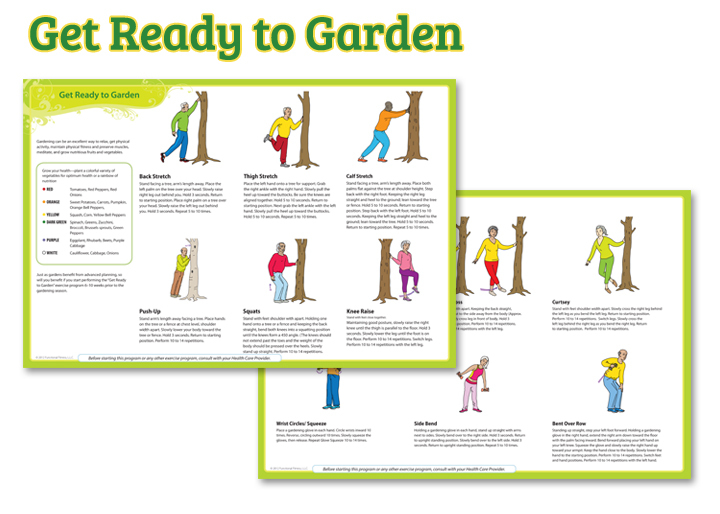 The Get Ready to Garden program provides a series of exercises to stretch and strengthen the major muscle groups used while working in the garden. Performing the exercises will help prevent stiffness and muscle soreness resulting from various uncomfortable gardening positions such as stooping, kneeling, bending, or squatting, as well as twisting, digging, or carrying heavy items. Performing the Get Ready to Garden program six to ten weeks prior to the gardening season will allow older adults to safely work in the garden, utilize gardening as a form of physical activity, and benefit from their harvest of nutritious vegetables.